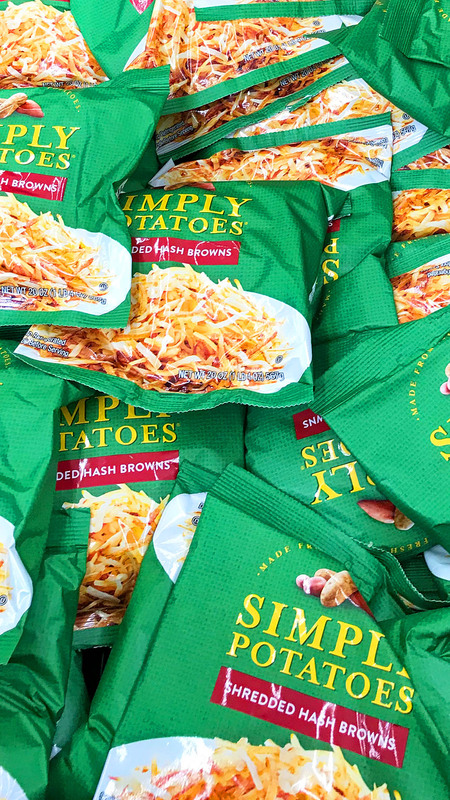 This post is sponsored by SIMPLY POTATOES® but the content and opinions expressed here are my own. 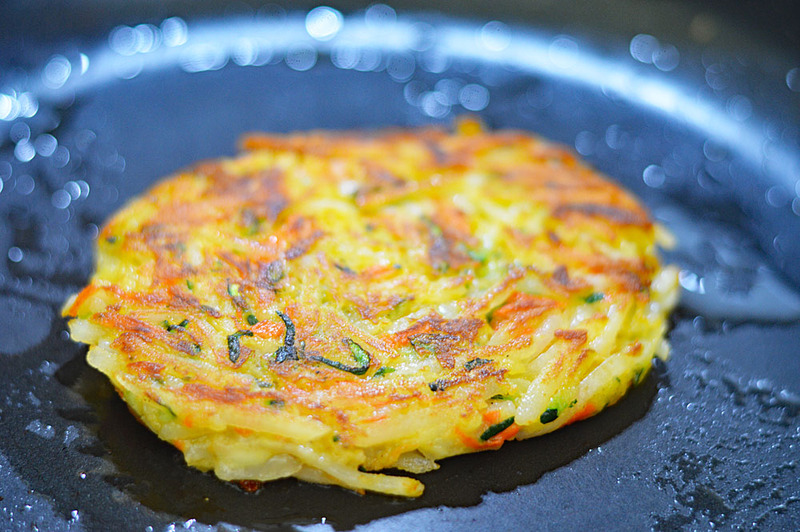 These are not your ordinary latkes! 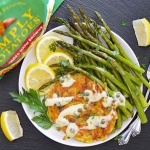 I have been thinking about how I might do a Piccata recipe for awhile now and when the opportunity came about to feature SIMPLY POTATOES®, I knew exactly how I wanted these to turn out. Don’t these look amazing? 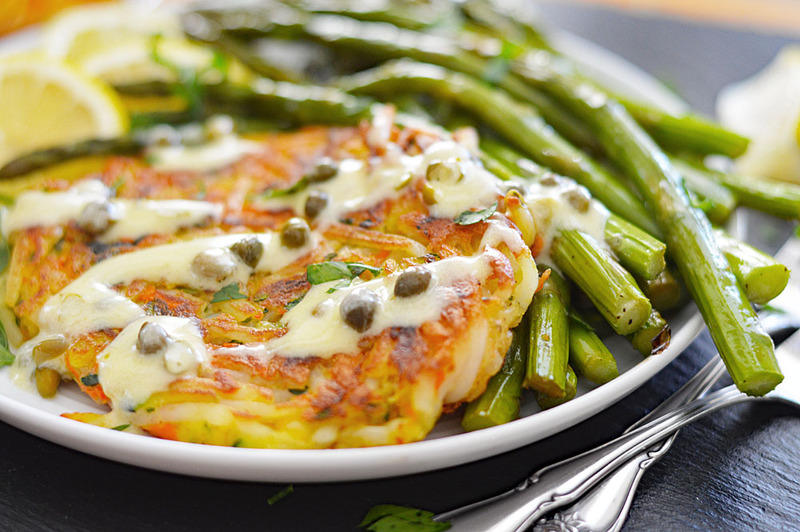 The pan-fried latke are served with a tangy lemon cream pan sauce with capers and a side of roasted asparagus. Finish it all off with a squeeze of fresh lemon juice and a sprinkling of salt and pepper. SIMPLY POTATOES® are produced with real ingredients, ready to use – making this dish so easy to prepare. No peeling, no shredding (my knuckles thank you). It’s a product that I just love to keep on hand. So let’s get started on this recipe, shall we? 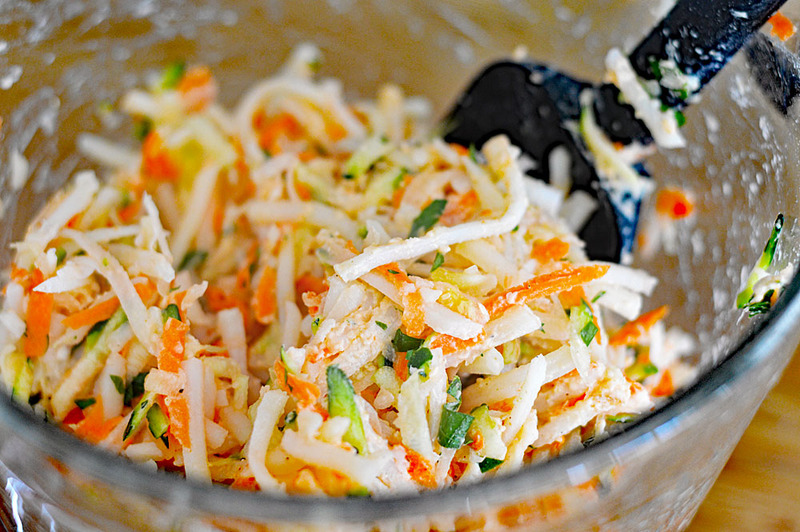 To the SIMPLY POTATOES®, I added shredded carrots, onion and zucchini. It’s really important to use paper towels to press out some of the natural moisture before proceeding. Just a few other ingredients such as baking powder, flour, salt, pepper, fresh parsley and seasoned salt. Our binder is a flax “egg” since we’re keeping it plant-based. You may think it won’t hold together, but trust me on this one. The mixture forms into patties and so long as you resist the urge to flip too soon during the pan-frying process, it holds together really well! You can use your spatula once they are in the pan to flatten and shape them. Using a really good non-stick pan aids in having to use as little oil as possible during the process. I cooked it over medium high heat until browned on one side, then carefully flipped to repeat. Last but not least, I made a simple sauce with lemon juice, non-dairy butter, capers and a bit of non-dairy creamer. If the sauce seems to want to break a bit, just add more of the creamer and whisk until it’s incorporated. This sauce is so quick and easy, but it really complements this dish! 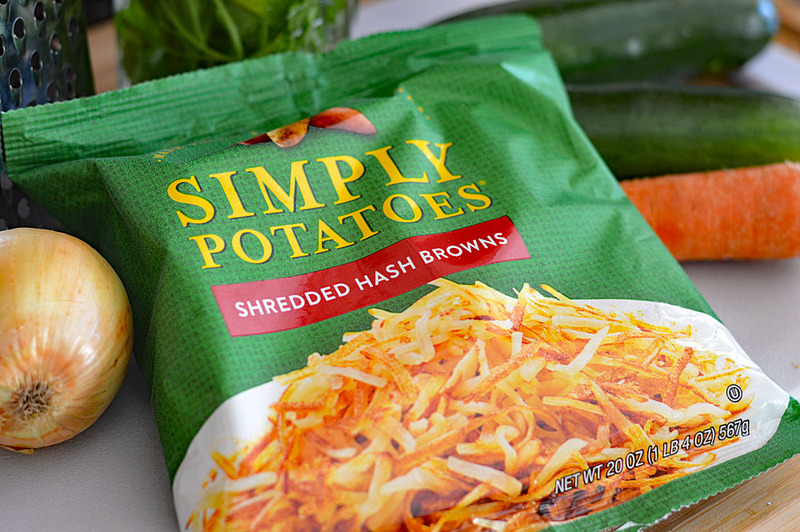 To the SIMPLY POTATOES® Shredded Hash Browns, add the remaining latke ingredients. Be sure you have patted the veggies dry. Using your hands and a large scoop of the prepared mixture form them into patties. Place into a hot pan with about 1 tbsp of oil over medium heat. 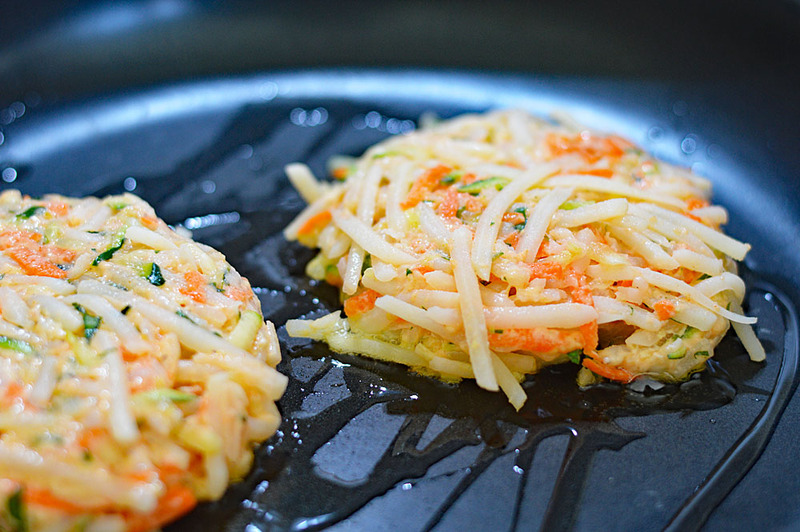 You can then use your spatula to flatten or reshape them after they are in the pan. Allow to fully cook on one side. You will know when it's ready to flip once it's golden. Repeat on the other side. Remove to paper towels to drain any residual oil. 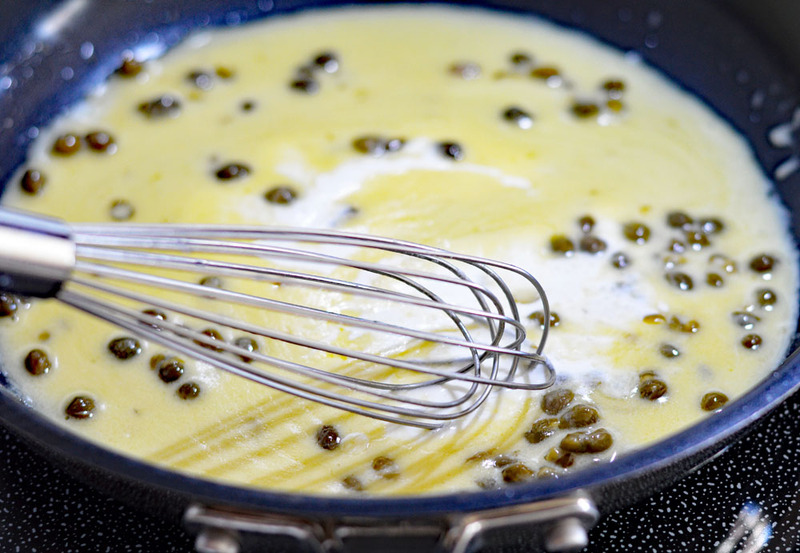 In a small sauce pan, add the lemon juice, capers and non-dairy margarine. Once melted, simply whisk in just enough of the non-dairy creamer so that it comes together. 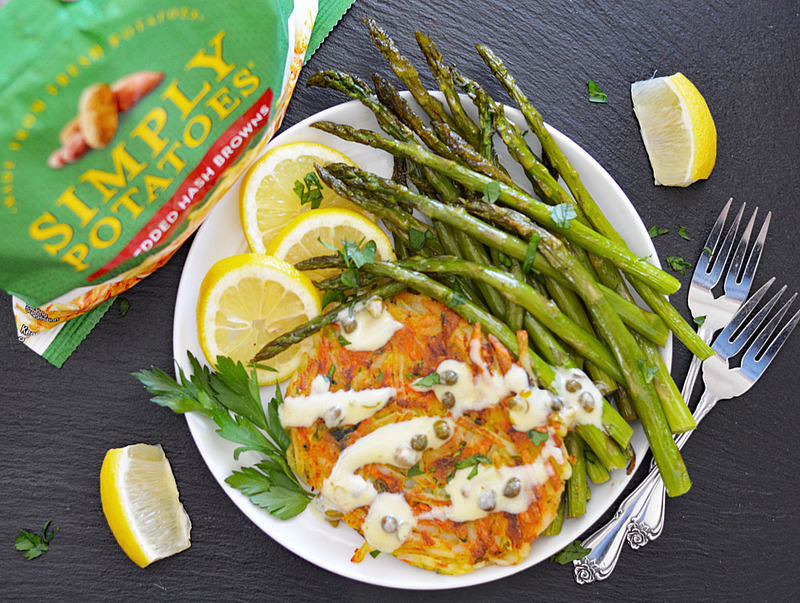 Serve with roasted asparagus and top each of the latke with the lemon cream sauce. Garnish with fresh parsley and enjoy immediately. I’d love to make the Cheesy Hash Brown Cups recipe! I’d like to make the Cheddar & Bacon Potato Salad recipe. As soon as I saw the CRUNCHY TOPPED CHEESE HASH BROWNS, I knew I had to make them! they look delicious!! Your latke piccata also looks delicious! Yummo!! I would use their steakhouse seasoned diced potatoes to make their recipe for cheddar bacon potato salad. We don’t eat potato salad as much in the winter, but in the summer we eat it at least once a week. I’d like to try the quick and easy sweet potato pie.